It's Batman & Robin meets... THE GRADUATE?! What happens when a big time superhero decides to sleep with her young, upstart sidekick? Find out in the adventures of COUGAR and CUB! 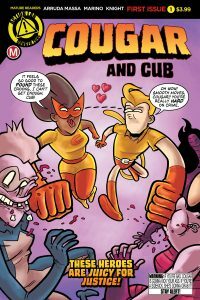 Come to either Comic Bug location next Wednesday to admonish the deplorable creators of Cougar and Cub, ROSIE KNIGHT and NICK MARINO. They'll be signing COUGAR & CUB at our Culver City shop from 11:00 am to 2:00 pm and at Manhattan Beach from 5:00 pm to 8:00 pm. It's our first signing of the year! Let's get this motor running!